The shunt resister, also known as the current sense resistor, is designed with the specific purpose of measuring either direct or alternating current. The shunt resistor is designed to accomplish this by that actual drop in voltage across the surface of the resistor. Most people are familiar with a common device used to measure an electrical current. This device is called an “ammeter” and the measured outcome is figured by using something knows as “Ohm’s Law”. Ohms Law is a mathematical equation used to determine the actual current flow within the resistor. When the current is too high within the resistor for the ammeter to safely measure it, a shunt resistor is placed within the circuit design. The shunt resistor, when properly placed, divides the current so that only a portion of it flows through the ammeter upon measurement. In this way, high voltage currents can be accurately and safely measured since only a predetermined percentage is needed to calculate the total voltage current running through the circuit. The scaling is also important in order to ensure that the amount measured does not exceed the specified voltage rating of the device. 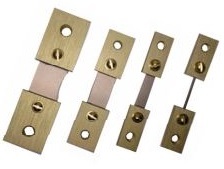 Riedon manufactures precision shunt resistors with low values of resistance. A well-designed shunt resistor by Riedon will have the lowest possible resistance value. This is done in order to ensure as little interference as possible with the functioning circuit. Being able to accurately sense the voltage drop across the resistor is the main function of the precision shunt resistors. Optimal placement of the precision shunt resistor within each device is crucial to the proper performance of the device. The experts with Riedon know how to provide the customized design solutions you need for high voltage precision circuits. Proper calculation depends on precise design and placement of the shunt resistor. Riedon understands how to effectively optimize all specific, identifying parameters within the shunt resistors. These include the maximum current rating, the power rating, the resistance tolerance and the temperature coefficient of resistance. Each defining parameter within the shunt resistor is designed for a specific purpose. For example the power range refers to the amount of power that the shunt resistor is able to dissipate within a specified temperature range, without damaging the integrity of the shunt or the device. Riedon understands that high quality, well-tested, precise shunt resistors matter when it comes to product reliability and longevity. The Riedon engineering experts are working day and night to bring the you very best in resistive technology solutions. Contact a Riedon team member today for more information about the customized options available to you, delivered on time with the best guaranteed.